Do Bees Like Van Gogh? 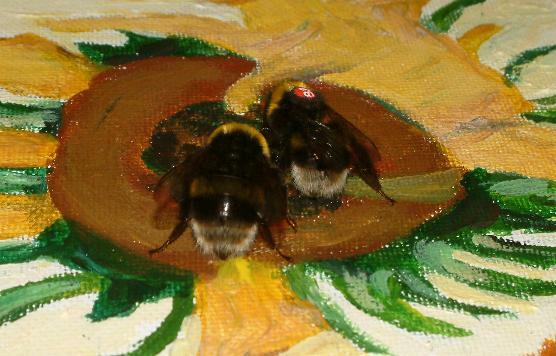 Worldwide interest in the bees and flower paintings project by Dr Lars Chittka of QMUL and Julian Walker. 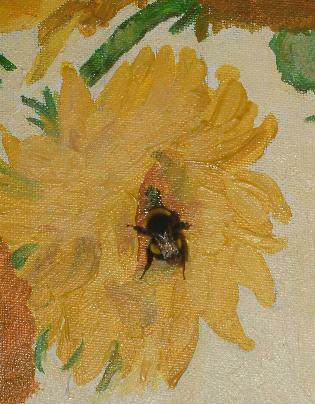 Google search on Bees Van Gogh reveals media interest: reviews/reports in Art Monthly, Science Magazine, BBC, Discovery Channel, ABC , and more. Do Bees Like Van Gogh's Sunflowers? Colour vision is biology, not simply physics. This is because colour vision systems differ widely between different animal species. The colour that an animal sees depends on its particular colour receptors and post-receptor neuronal wiring. Flower colours have evolved over 100 million years to address the colour vision of their bee pollinators. In a much more rapid process, cultural evolution has produced images of flowers that stimulate aesthetic responses in human observers. The colour vision and analysis of visual patterns differ in several respects between humans and bees. In this project, a behavioural ecologist (LC) and an installation artist (JW) explore how bees react to paintings of flowers. We use this unconventional approach in the hope of raising awareness for between-species differences in visual perception, and to provoke thinking about the implications of biology in human aesthetics and the relationship between object, representation and its (biological) connotations. Following the online publication of our paper on this project (see QMUL website & link to Optics & laser Technology site above) the research has been reported widely, including interviews with BBC radio, television and World Service, ABC, Discovery Channel; articles in Science magazine and Art Monthly; and reports in all major UK newspapers and newspapers worldwide. The project is now entering its second phase, which will include further testing of pictures, an installation where the public can watch bees exploring replicas of famous paintings, and further research into the implications of an evolutionary and biological background to aesthetics.